Description: Made from 600D polycanvas and diamond non-woven material. Main zippered compartment. Front main pocket and pen loop. Side mesh water bottle pocket. Permanent adjustable shoulder strap. Two carry handles. Available in 3 colours. 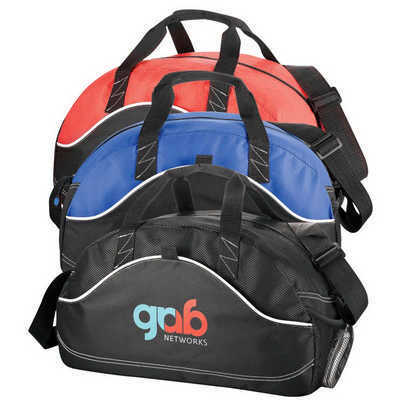 Features: Very popular sports bag for all ages. Includes storage options and carry options. No business card holder featured. Packaging: Polybag Colour: Black. Material: 600D Polycanvas and Diamond Non-Woven Product Size: 254mm(h) x 445mm(w) x 203mm(d) Freight details : 40 per carton, 11.5kgs, 50 x 31 x 40cms; Decoration Type(s): Colour Print / Embroider / Full Colour Print Decoration Area: Screen: 153mm(h) x 76mm(w). Transfer: 153mm(h) x 76mm(w). Embroidery: Centred on front pocket: 120mm Dia. Other Methods: Contact your decorator for applicability and size.